This article was published in Lark Hotels' magazine in 2017. Restaurants serving local food is de rigueur these days. Discerning diners look for the list of nearby farms at the bottom of every menu and expect each dish to be carefully crafted to capture the rhythm of the seasons. Lark Hotels’ destinations in particular are known for vibrant restaurant scenes where award-winning chefs use local ingredients to express the personality of their region. We wanted to know which local foods inspire these chefs, so we trekked to four Lark Hotels cities to find out. Servers shuttle blue and white dishes piled with steaming “wrapped treasures” under the watchful eye of a large copper dragon mounted high on the wall above. BaoBao Dumpling House, a 36-seat restaurant, is run by Cara Stadler, a young chef who quickly garnered national attention when she opened her first restaurant, Tao Yuan in Brunswick, Maine, in 2012. In 2014, Stadler was crowned Food & Wine magazine’s Best New Chef in New England and nominated for a James Beard “Rising Chef” Award. That same year, Stadler opened BaoBao, where she serves a small menu of Chinese comfort food: ten kinds of dumplings plus a few salads and larger entrees. As food arrives, the restaurant’s black table- tops quickly fill with small plates and dishes: a heaping bowl of peanuts softened in tangy black vinegar (Beijing Black Vinegar Peanuts); shredded red cabbage, pea pods, and carrots, tossed with a tangy dressing and topped with crispy fried shallots and chopped peanuts (Asian Slaw). The dumplings come six to a plate—filled with delightfully simple pork and cabbage, spicy Kung Pao chicken, shrimp and bacon, or tender hake and burdock root. Beyond locally-grown food, Louis even considers the history and culture of the state when crafting new menu items. As a nod to the early English inhabitants of the New Hampshire Seacoast, Louis uses boiled apple cider, reduced to a taffy-like consistency, to add sweetness to dishes and cocktails. He smears it on a plate and tops it with crisp Anadama croutons, sticks of thinly-sliced Bosc pear, and chunks of Camembert cheese to create a well-balanced vignette of flavors. When an entree dubbed “Johnny Cake Community” arrives at the table, diners are directed to place a thin cornmeal pancake (the Johnny cake, a regional specialty) atop a Bibb lettuce leaf, ll it with sweet, shredded pork and garnish it with the accompanying accoutrements (crispy fried onion strands, sweet pickles, and a spicy barbecue sauce). The result is delicious, but as a shared experience, it also reveals why Chef Louis considers this Moxy’s signature dish: it’s made with local ingredients, steeped in history, and meant to be shared over a cozy table. Louis has created a space that celebrates the culinary roots of his home state, playfully elevating tried- and-true New England cuisine to please today’s savvy foodie. On the island of Nantucket, a well-known local chef embraces his region’s cuisine with equal fervor, placing fresh seafood at the forefront of his restaurant’s ever-changing menu. At Dune, chef/owner Michael Getter says he changes the menu with the seasons, as diners naturally gravitate towards grilled items, salads, and vinaigrettes in the spring and summer, then onto richer braised and slow-cooked dishes in the cooler months. Getter opened Dune in the heart of the Nantucket village in 2009. The Culinary Institute of America graduate and New Jersey native fell in love with the Island after graduation, spending his summers cooking and surfing, then heading to Steamboat Springs, Colorado for a season of skiing. He became the executive chef at the seasonal (now shuttered) 21 Federal when he was just 24, which allowed him to do the “seasonal shuffle” for a while longer. The opportunity of American Seasons eventually anchored him to the Island full time. At Dune, Getter continues to express his love of Nantucket’s farms and surrounding waters. Getter says the beet salad is a customer favorite that’s been on the menu for years. The dish’s description alone — roasted beets with whipped goat cheese, pistachios, herb oil, beet vinaigrette, and aged balsamic — belies the whimsical plating: rounds of pink and white Chioggia beets pop against a backdrop of white cheese, and the green pistachio and herb oil swirl like something from Alice in Wonderland. Getter uses local and native produce, like cranberries and foraged mushrooms, to highlight and complement carefully cooked meats and seafood. seafoods. Locally harvested seafood specialties, like Grey Lady oysters and Nantucket Bay scallops make the chef’s job easy when it comes to showing off the Island’s bounty. On the West coast, the chef at Ninebark in Napa finds an endless amount of produce at his disposal for his restaurant’s creative cuisine. Northern California’s mild climate allows for year-round availability of fresh, local produce, so chef Matthew Lightner focuses his energy on less common methods of preparation, like smoking, grilling, and marinating, to show off the flavors of his adopted state’s native cuisine. Ninebark opened in October 2015 to great acclaim. Fans of Lightner followed his move across the country from New York’s Atera, where he was awarded two Michelin stars during his tenure. A Missouri native, Lightner began his culinary career on the West Coast, and after time spent abroad and in New York, moved back to California primarily for the produce. “I am completely inspired by this region and the wealth of ingredients available all year-round, and my menu re ects this,” he says. Ninebark’s menu is characterized by an ever- changing selection of carefully constructed dishes, frequently garnished with edible flowers and flourishes of fresh herbs. The highlight is the selection of skewers – a rotating selection of proteins like local trout, mussels, and foie gras, served over a bed of complementing pairings. The foie is smoked and served on a bed of seasonal shelling beans and fermented truffle— an updated take on pork and beans, which, Lightner says, invokes a sense of nostalgia in diners. Before its opening, the most anticipated feature of Ninebark was the rooftop deck, designed by New York firm AvroKO. Visitors and locals alike now bask in the expansive views of the Napa Valley from this third floor terrace. Naturally, the view is best enjoyed with a cocktail in hand, such as a Panache Indochine, made with lemons from Ninebark’s own garden, gin, ginger, makrut lime, and topped with a splash of a California IPA. 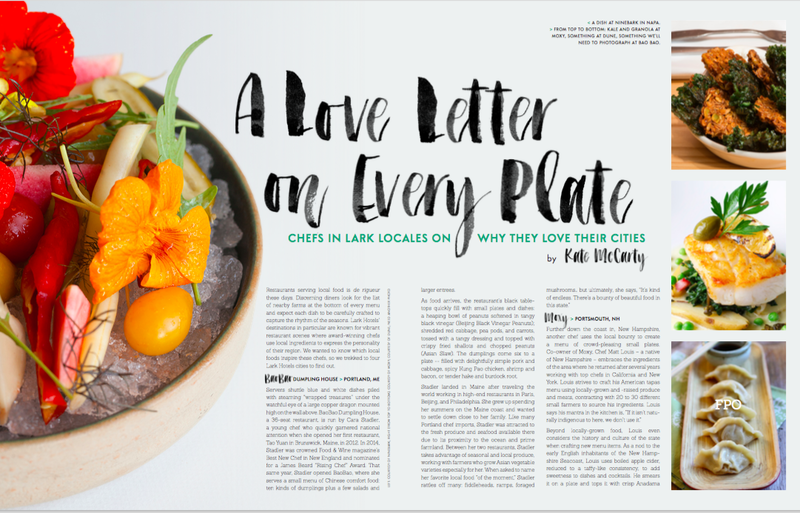 Like so many other chefs in Lark Hotels’ destinations, Lightner creates a love letter to his city with every plate he sends out from the kitchen.